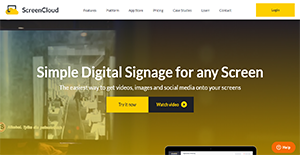 ScreenCloud is a dynamic digital signage content management solution. It turns any screen into an interactive digital signage that catches the attention of existing and prospective customers. With ScreenCloud, administrators can control one or numerous screens from a single console, regardless of their location. That is because the application amalgamates digital signage data to make it easier to manage content. Moreover, ScreenCloud can be readily used with any available hardware. It works smoothly from a regular TV screen connected to a device like Amazon’s Fire TV Stick. This lets businesses save on financial resources as they can utilize existing hardware or if they must purchase one, they still have a plethora of options that can fit their budget. As ScreenCloud supports the uploading of unlimited photos, videos, and documents, businesses can create one or multiple dynamic playlists. This lets them queue content that they want to show audiences at a time just by dragging and dropping them on the interface. For businesses that have multiple locations, it can be a challenge to synchronize media shown on digital signages. But with ScreenCloud, they can easily solve this conundrum, as the application lets administrators control numerous screens from a single console. This allows companies to synchronize content across all branches while giving a margin of freedom for location-specific content. ScreenCloud does not have a proprietary device that they require customers to purchase to turn their screens into digital signages. Instead, it works with various hardware like Google Chromebit and Chromecast, Android TV, Amazon Fire TV and Fire TV Stick, as well as Android devices and Windows and Mac computers. This makes the application affordable, as companies can use hardware they already own or acquire one that fits their budget. Businesses can make their digital signages more engaging by adding live social media feeds, weather updates, news, and more. ScreenCloud enables these through the applications available in its marketplace, where there are over 50 apps available. These connections allow companies to provide important information to their customers as well as give them a break from promotional and marketing content. In case the internet connection is interrupted, businesses can rest assured that ScreenCloud will continue to work. The application employs a smart technology to ensure that media continue playing even when the Wi-Fi is not working. As for power interruptions, ScreenCloud automatically reboots devices to continue with the scheduled content. ScreenCloud’s customer support team can be counted on to aid with technical problems. They also check in with customers regularly to ensure that they are not having difficulties with the product. It is crucial to keep in mind that almost no software in the Content Marketing Software category will be a perfect solution able to match all the requirements of various business types, sizes and industries. It may be a good idea to read a few ScreenCloud reviews first as specific software may excel only in a very narrow group of applications or be prepared with a really specific type of industry in mind. Others may function with a goal of being simple and intuitive and therefore lack complex functionalities needed by more experienced users. You can also find solutions that focus on a broad group of customers and provide a powerful feature base, but this frequently comes at a more expensive price of such a solution. Be certain that you're aware of your requirements so that you get a solution that offers specifically the features you search for. How Much Does ScreenCloud Cost? ScreenCloud offers simple enterprise pricing: $20.00 per screen per month. Screen time is also billed pro rata, which means if a screen is connected only for half a month then a company will only be billed for that time. Remaining hours will be credited to the company’s account. Educational and non-profit institutions are entitled to a 20% discount. To avail of this, send an email to ScreenCloud during the free 14-day trial. The solution is also available from resellers. For more information regarding the product and the subscription packages, contact sales by phone, email, or web form. We realize that when you make a decision to buy Content Marketing Software it’s important not only to see how experts evaluate it in their reviews, but also to find out if the real people and companies that buy it are actually satisfied with the product. That’s why we’ve created our behavior-based Customer Satisfaction Algorithm™ that gathers customer reviews, comments and ScreenCloud reviews across a wide range of social media sites. The data is then presented in an easy to digest form showing how many people had positive and negative experience with ScreenCloud. With that information at hand you should be equipped to make an informed buying decision that you won’t regret. What are ScreenCloud pricing details? What integrations are available for ScreenCloud? For more information regarding hardware connections, contact support. If you need more information about ScreenCloud or you simply have a question let us know what you need and we’ll forward your request directly to the vendor.